When Pitch & Scratch came up with their “Hamburg Hustle” in 2009 it was a revelation. These guys studied the 70s school of funk and soul, were digging deep in disco roots and knew what a good hiphop beat was all about. Then there was “Everybody Move” with its irresistible party vibe and an ultra-charming video clip, putting smiles on face all around the globe from sportsbars in Australia to lavish cafés in the south of France. And we should not forget to mention: It was a completely instrumental affair! What a statement. 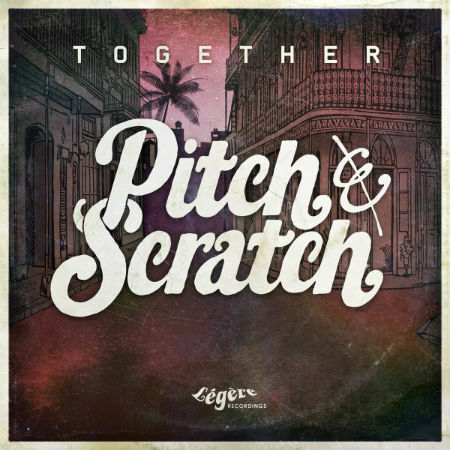 Now we arrived in 2012 and Pitch & Scratch got their act “Together”. DJs Mzuzu and Suro from downtown Hamburg took seriously what Beats International advised back in the days: “The hustle is on the way out, and we gotta come up with a new rhythm”. In Pitch & Scratch’s case, they do not limit themselves to just one rhythm. “Together” is full of global vibes. The method is simple but effective: After the release of the “Hamburg Hustle” album Pitch & Scratch were out and about getting props for their instrumental arrangements. But why not take the next step and introduce vocalists and lyricists who share a similar, funky and peaceful vision to the family? This is where Wayne Martin comes in. Born in New Orleans and now living in Europe this respected blues singer came up with the very personal, heartfelt “Papa Never Was A Genius”, which Mzuzu and Suro turned into an uplifting latin-soul mover. Speaking of uplifting spirits: With the voice of Brazilian singer Leila Pantel in “Maculele” and “Vem Meu Bem” tropical grooves meet Hispanic vibes. Enter Seanie T. The rapper from South East London is talking serious business. “Pitch Me And Scratch Me” is a piece of true, down to earth and gritty UK Hip-Hop. Plus there can only be one Alex Prince, well known in the German urban scene, to top this funky line-up of vocalists. “Funk Is Ruling in My Head” has the message in the title and is taking Alex Prince back to the roots of funk. But what would the funk be without the horns and the percussion. “Together” is a big shout-out to the power of brass. Here we have the Diazpora Horns, the Boxhorns (of Jan Delay & Disko No.1) and Pitch & Scratch’s homies of the Superbad Horns. Put this in line with the super tight percussion of Lack of Afro in “Papa Never Was A Genius” and we have something really special going on. Towards the end of the album Pitch & Scratch join the “Road To Saturn” while they “Roll’n Rock”. Here we have it all “Together”: Deep, serious clubby vibes, from the people for the people, no posing just the groove next to the adrenalin of a sweating Northern Soul dancefloor packed with a crowd which is completely in it for the music. That’s what we call “Together”!